121 Commercial Real Estate and Properties in Sa Country South are listed in 9 categories. We have 39 Commercial Farms for Sale & Lease , 30 Retail Shops for Sale & Lease , 23 Offices for Sale & Lease , 13 Industrial Warehouses for Sale & Lease , 9 Development Lands for Sale & Lease and 4 Hotels and Leisure for Sale & Lease . Recently Renovated Office/retail Space $16,000 PA + GST + OUTGOI.. Extremely Well Maintained Offices/consulting Rooms $16,800 PA + GST + OUTGOI..
Approx 95m2 former residence converted into offices/consulting rooms in quiet side street location next to Michcon office and service station. Comprises: Approx. 20m2 air conditioned waiting/reception room, approx. 15m2 kitchen/staff room, approx. 15m2 carpeted office with built ins, 2 x consulting rooms (approx 10m2 12m2) with small reverse cycle air conditioners, 1 x basin and data points plus full bathroom and laundry. Features include: immaculate interior paintwork, polished floorboards, security system and ramp for disabled access. The property includes a double carport and a double garage. Immaculate Office $49,200 PA + GST + OUTGOI..
Approx. 271m2 immaculate office property located in a unique business location adjacent to Allen, Liston & Co and near Blue Lake Veterinary Clinic. This former Mount Gambier stone and dolomite villa is currently being used for professional offices and is in excellent condition. The property is zoned ‘Residential’ and has approval for its current use. The property is currently occupied by multiple tenants on a periodic basis and the area available For Lease is fully negotiable. It may be taken as a whole or only portion thereof. Comprises: Generous foyer, reception area (approx. 25m2), 9 offices (areas ranging from approx. 8.1m2 to 30.6m2), multiple storage rooms (one with compactus), large kitchen, a cellar and male and female amenities. Additional features include: Multiple entrances, security system, air conditioning and a welcoming front garden. The existing allotment is currently being sub divided and a new driveway will be made on the southern side to access the 6m x 6m Colorbond shed and on site carpark at the rear. Contact us today to inspect this impressive property! Small Retail Premises In High Traffic Location $12,000 PA + GST + OUTGOI..
Large Office With Huge Frontage $42,000 PA + GST + OUTGOI..
Approx 184m2 office property located in a high traffic location with a huge Helen Street frontage of approx 18m (near Morony Financial Services, Complete Real Estate, PMN Lawyers and Tonkin Consulting) Comprises of 4 x offices (ranging from 11.37m2 27.39m2), a meeting room of approx 15.5m2, waiting/reception area of approx 42m2, open plan office space of approx 29m2, 1 x storage area of approx 11.90m2 plus 2 x kitchenettes and 2 x toilets Features include: ducted reverse cycle air conditioning, alarm system, freshly painted interior 3 x on site carparks included Incentive: 3 months rent free The Landlord will consider splitting the tenancy into two halves, subject to finding a tenant for the balance. Call to arrange your inspection today! Approx. 191m2 retail shop with large street frontage in high traffic, main street location Comprises: Large air conditioned retail area of approx. 180m2, kitchenette and office nook + amenities 1 x on site car park at rear (via Mitchell Street) when not in use for loading purposes The property is currently undergoing some maintenance/improvements and the available date is to be determined (inspections are still welcomed). Additional photographs to follow. This large warehouse property is located in a small industrial precinct on the western side of town. 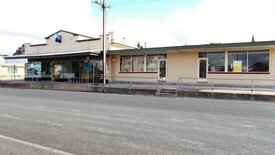 The premises is shared with PFD Food Services Pty Ltd and an office that is currently vacant. The warehouse is approx. 1,038m2 (internal measurements approx. 21.45m x 48.53m) and has a roller door with approx. 4.5 metre clearance and a screen door option. The property is securely fenced and contains a security system. Three phase power is available If amenities and/or office space is required, the 109m2 office is available for lease at $14,000 plus GST and outgoings. Arrange your inspection today! The former residence is a Mount Gambier stone and dolomite villa (which has been renovated and upgraded) and is currently being used for professional offices. The property is zoned ‘Residential’ and approval has been obtained from the City of Mount Gambier for its current use. When you walk in the front door, you enter an impressive foyer leading to the large reception area (approximately 25m2). The remainder of the building comprises nine offices (areas ranging from 8.1m2 to 30.6m2), a storage room, large kitchen, a cellar plus amenities with a total area of approx. 271m2. The building is in excellent condition and has been well maintained. A driveway will be installed on the southern side of the building and there is a double garage (approx. 6m x 6m) available plus on site and off street car parking is available onsite. We are offering the property For Sale or For Lease as a whole or on a shared basis. Contact us for further details of this impressive property for lease – either as a whole or in 2 3 sections. Quality, Location And Flexibility $25,600 PA + GST + OUTGOI..
Approx. 191m2 air conditioned first floor office property (behind ANZ Bank) on Commerce Place, balcony views over the public car park. Comprises: Approx. 49m2 meeting room, 2 x separate offices, open plan office area, 2 x storage rooms plus amenities Some undercover parking included plus large public carpark close by Don't miss this rare opportunity, arrange your inspection today! Approx. 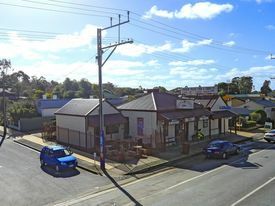 116m2 retail property in high traffic location near Eddies furniture, East Gambier Post Office and South Eastern Hotel Comprises: 80m2 air conditioned retail area, approx 9m2 office/storage area, approx 25m2 secure shed storage, amenities and shared courtyard. Features: quality flooring and paintwork plus security system Incentive: 3 months rent free Arrange your inspection today! Office And Shedding In Industrial Precinct $50,000 PA + GST + OUTGOI.. Located within a cul de sac in the industrial precinct on the Eastern side of Mount Gambier is this large warehouse/shed formerly occupied by Komatsu Forestry. The building of approx 493m2 comprises: air conditioned reception area, 2 separate offices, 2 toilets, kitchenette/lunch room, shed space of 154m2 plus additional shed space of 311m2 All of the offices, including the reception area, have reverse cycle air conditioners, tiled flooring and are neat and well maintained. The premises has an alarm system available. The sheds have 3 phase power, industrial lighting and 4 industrial sliding doors with a clearance of approx 5.5m. Large, secure yard of approx 1,570m2 Don't miss this rare opportunity, arrange your inspection today! Located on the Corner of Pollard Close and Ralston Road in the eastern industrial precinct is this small neat and tidy office with extra warehouse space Approx 227m2 comprises: Approx 15m2 reception area, approx. 8.3m2 office, approx. 11m2 kitchenette/lunch room, approx. 17m2 storage room, approx. 13.7m2 first floor office space, amenities and approx. 120m2 shed area with roller door access via Pollard Close 2 on site carparks and plenty of side street parking available Arrange an inspection today! Great Office Space $24,000 PA + GST + OUTGOI..